Ben Robinson | Color Green Creative, for AIM Media Midwest The 2018 Covington High School Homecoming court includes, from left to right, boys, Chad Yohey, Samuel Hutchinson, Caleb Rawson, Gray Harshbarger, Tyler Fraley, Parker Dysinger, Keringten Martin; and girls, Anna Winn, Ashlyn Plessinger, Samantha Whiteman, Makenna Gostomsky, Sarah Remley and Chelsea Ford. A community pep rally will be held at 7 p.m. Wednesday at Smith Field. 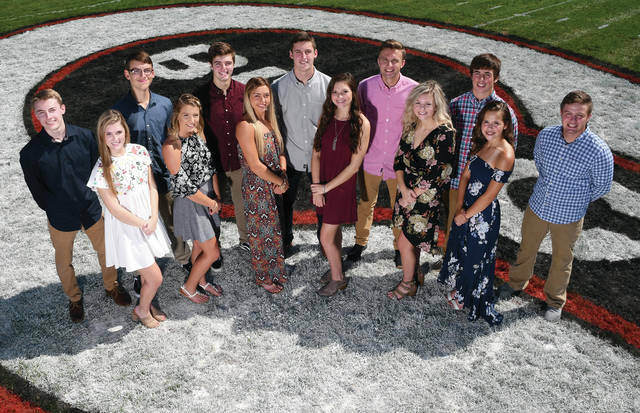 The homecoming court will be introduced, along with fall sports teams and a few activities from the band, cheerleading squad and FFA students. On Friday, there will be a district pep rally for all the students at the end of the day. Starting at 4:30 p.m. in the bus turnaround (outside the K-8 building), there will be a block party/tailgate, with the parade starting at 5:30 p.m. The parade will be from the K-8 building to Smith Field, so participants should stand along Chestnut Street in that area for a good view. The king and queen will be crowned before the start of the game, with the kickoff at 7 p.m.
To finish the week, there will be a homecoming dance from 8-11 p.m. Saturday in the K-8 cafeteria for students in grades 9-12. Tickets are pre-sale and must be purchased by Friday, Sept. 28. The cost is $10 and students may buy them before or after school until 3:15 p.m. from Mrs. Anderson or during lunch. https://www.dailycall.com/wp-content/uploads/sites/30/2018/09/web1_BEN_4212-1.jpgBen Robinson | Color Green Creative, for AIM Media Midwest The 2018 Covington High School Homecoming court includes, from left to right, boys, Chad Yohey, Samuel Hutchinson, Caleb Rawson, Gray Harshbarger, Tyler Fraley, Parker Dysinger, Keringten Martin; and girls, Anna Winn, Ashlyn Plessinger, Samantha Whiteman, Makenna Gostomsky, Sarah Remley and Chelsea Ford.